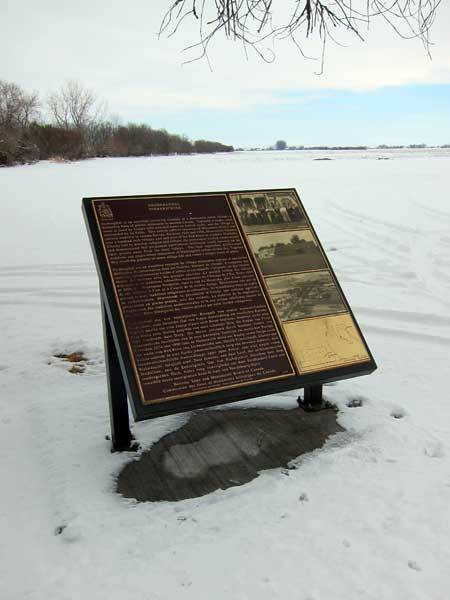 Neubergthal was founded in 1876 by a group of related Mennonite families on the open plains of southern Manitoba. The village is now surrounded by flat farmland. The community occupies six sections of land where residences, farmyards, and communally owned arable fields and pasturelands are arranged in long narrow farmsteads. The farmsteads that form the village are positioned in traditional fashion behind fencing along a single tree-lined street, creating a distinct identity. Official recognition refers to the street village on the block of six sections of land. In 1998, Neubergthal was designated a National Historic Site by the Historic Sites and Monuments Board of Canada. This page was prepared by Tim Worth and Gordon Goldsborough.